Create Pulp-Noir plots that will keep your players on their "A" game! 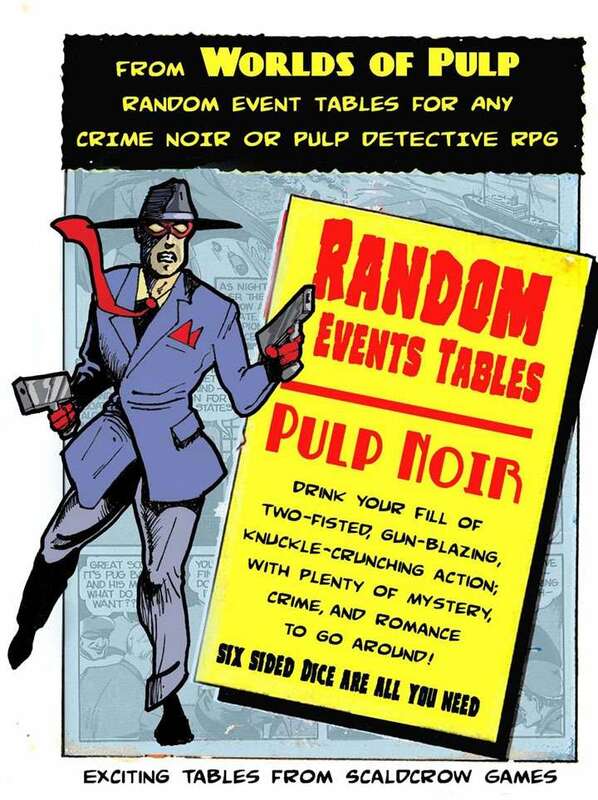 Add exciting content to your pulp hero and pulp-noir Campaign. How many times does the local bank get robbed in your super hero game--Too many? Are you starting to run a little thin on responses to what characters see while on patrol? 16 pages of tables and event hooks offer thousands of possibilities for your game. Add your personal touch and the possibilities become endless. Our tables are designed to give quick and exciting possibilities to any super hero campaign while preserving an appropriate comic book feel. Includes 36 story plot twist/theme builder categories that created even broader possibilities by changing the slant by which a story is told. What if you are part of a manhunt and the fugitive on the run, turns out to be the hero's best friend, or better yet the heroes are the subject of mistaken identity and they are on the run? Here is the base table. Each of these headings has a sub-tables and the possibilities of added pulp tropes. Additional tables are included in this book as well, for added flavor and event possibilities.